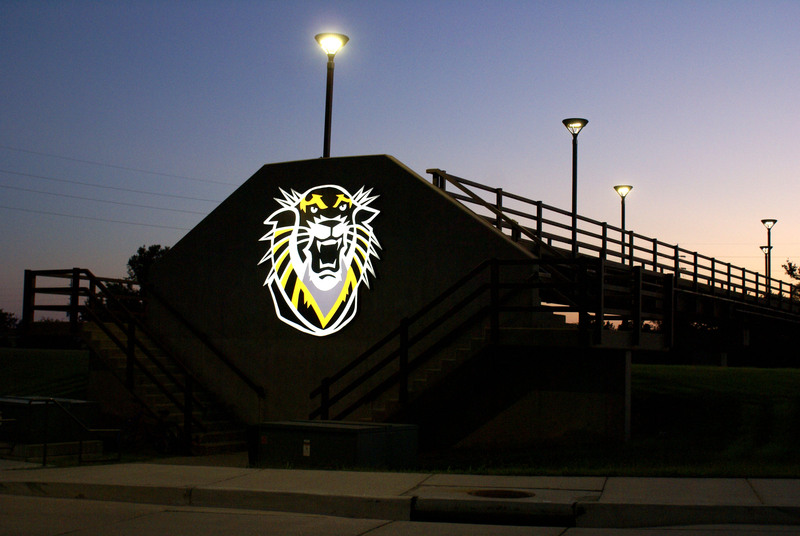 HAYS, Kan. – Fort Hays State University students walking to Cunningham Hall by way of the Cunningham walking bridge for early morning classes today were greeted by a huge glowing Victor E. Tiger on the east end of the bridge. The bright black, white and gold university mascot was installed Monday morning by Commercial Sign Co., Hays. RDH Electric coordinated the electrical connections to the sign, which is controlled by a photo cell and lit up for the first time about dusk on Monday. Two freshmen were excited when they learned they were the first students to see the new Tiger lit up Monday evening. Mattie Ross, an agriculture business major from Toponas, Colo., is a member of the women’s track and field squad. Dakota Blaylock, a computer science major from Halstead, runs for the men’s cross country and track teams.  They had been attending an event for student-athletes in Cunningham Hall and were returning to their residence halls with full plates of pizza when they descended the steps and saw the Tiger. “It definitely adds more light,” Blaylock said. “That’s pretty cool,” Ross said. Dr. Charmane Kandt remembers walking across Cunningham bridge while working on her master’s degree at Fort Hays State in the mid-1980s. Kandt, now an instructor of health and human performance and coordinator of the Neuromuscular Wellness Center on campus, happened to be riding her bicycle on the FHSU campus Monday night. Cunningham – no relation to Dr. Morton C. Cunningham, the fifth president of FHSU for whom Cunningham Hall and the bridge were named – said the project is just another example of the university partnering with the community of Hays. The Hays branch of Commercial Sign Co. employs two FHSU graduates, Kaylene Gabel and Matt Eberle, in the company’s graphic design department. Joe Leiker, manager of the Hays branch, said the complexity of the Tiger logo created a challenge but that the fabricators came through in flying colors. Tiger Gold on Friday is a partnership among FHSU Athletics, the FHSU Alumni Association, University Relations and Marketing, the Hays Area Chamber of Commerce and Eagle Communications. The committee is leading an effort to establish a tradition of wearing Tiger Gold every Friday. That tradition has caught on at Commercial Sign Co.